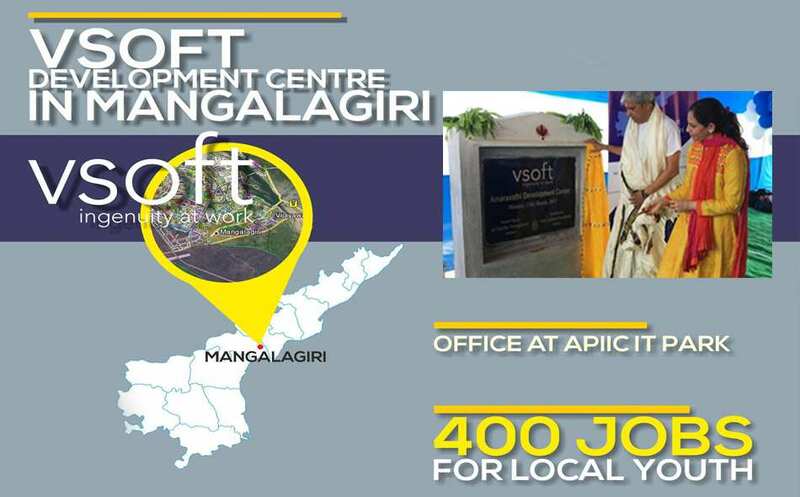 VSoft Technologies Pvt Limited, a global information technology solutions provider for financial institutions, performed Bhumi Puja (ground breaking) ceremony for its new development centre at Mangalagiri in capital Amaravati on Monday. The puja was performed by Murthy Veeraghanta, chairman and CEO of VSoft Technologies and the foundation stone was laid by Lakshmi Veeraghanta, director. Speaking on the occasion, Murthy Veeraghanta said that they were excited to be moving forward rapidly towards creating more than 400 job opportunities in the region. This is in line with commitment made to both the state government and the enormously talented people of Andhra Pradesh, he said. The Mangalagiri Development Centre is being set up on 1886 sq mts area, which has been allocated as per the industrial policies framed by the government of Andhra Pradesh, Murthy explained. The chairman said VSoft Technologies, which commenced its operations 20 years ago, has development centres in India and the United States where it provides IT products and services to more than 2,600 financial institutions globally, including major commercial, cooperative and public sector banks. Additionally, the company built a comprehensive platform based BPO (business process outsourcing) infrastructure where people, process and technology work in unison to drive, supportand accelerate business transformation, Murthy said. Executives of the company attended the programme along With their families.